Located in the heart of Malacca, this luxury hotel is steps from Hatten Square, Dataran Pahlawan Melaka Megamall, and Mahkota Medical Center. Mahkota Parade Shopping Mall and A Famosa are also within 10 minutes. This smoke-free hotel features a full-service spa, a restaurant, and an outdoor pool. Free WiFi in public areas, free self parking, and a free area shuttle are also provided. Additionally, a fitness center, a bar/lounge, and a poolside bar are onsite. All 704 rooms provide free WiFi and free wired Internet, flat-screen TVs with satellite channels, and conveniences like sitting areas and coffee makers. Other amenities available to guests include 24-hour room service, minibars, and rainfall showerheads. In addition to a full-service spa, Hatten Hotel Melaka features an outdoor pool and a sauna. The hotel offers a restaurant and a coffee shop/café. Guests can unwind with a drink at one of the hotel's bars, which include a poolside bar and a bar/lounge. A computer station is located on site and wired and wireless Internet access is complimentary. This 5-star property offers access to a business center. Event facilities measuring 15371 square feet (1428 square meters) include conference space. This Art Deco hotel also offers a children's pool, a fitness center, and spa services. A complimentary area shuttle within 2 km is available for guests. Complimentary self parking is available on site. 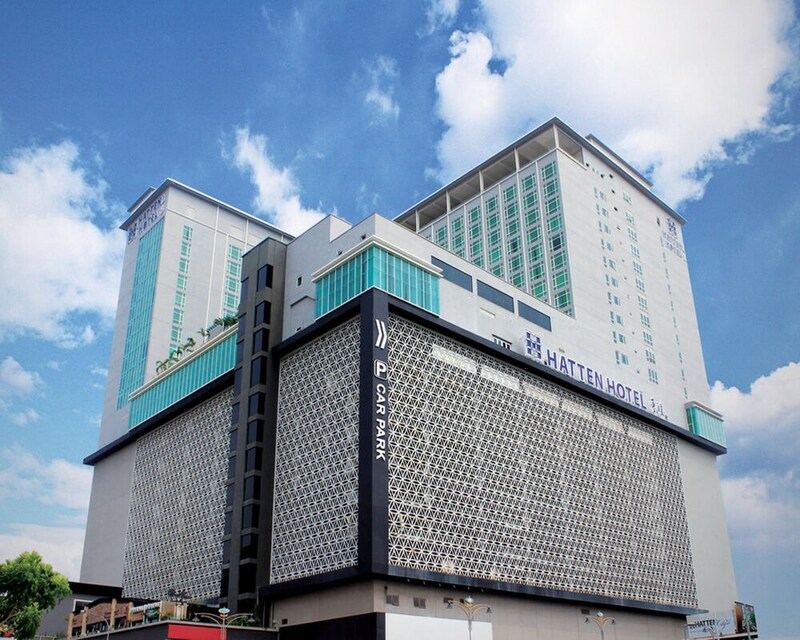 Hatten Hotel Melaka is a smoke-free property. Chatterz - This restaurant serves lunch and dinner. Open 24 hours. Alto Sky Lounge - This rooftop bar serves light fare only. Start your morning with a buffet breakfast, available each day from 7 AM to 10:30 AM for a surcharge. Room service is available around the clock. The onsite spa has 7 treatment rooms including rooms for couples. Services include facials, body scrubs, body treatments, and manicures and pedicures. A variety of treatment therapies are provided, including aromatherapy. Reservations are required for massage services and spa treatments. Reservations can be made by contacting the hotel prior to arrival, using the contact information on the booking confirmation. No pets and no service animals are allowed at this property. Book a stay in a "Premier Deluxe Suite" or "Premier Junior Suite" room type, for travel anytime, and receive express check-in and check-out at Premier Lounge (located on the 12th floor); free beverages, juices, tea or coffee at Premier Lounge (available 7 AM-9 PM); free snack time 3:30-5:30 PM and welcome drink at Alto Sky Lounge (on the 22nd floor) available 4-8 PM; complimentary standard fruit plate upon arrival; complimentary drinks in the minibar; bicycle rentals (subject to availability); and children under 5 years old eat for free. Must book a stay in a "Premier Deluxe Suite" or "Premier Junior Suite" room type to receive benefits. Full details at check-in. Offer subject to availability. Extra bed or breakfast available for additional surcharge. Offer is not valid with groups/conventions and may not be combined with other promotional offers. Other restrictions and blackout dates may apply.